Individual survivors and groups at risk of violence against women and girls in conflict and post-conflict settings require multiple types of services and support programs in order to address their needs and support their mental health and psychosocial well-being (UNFPA, 2012). Experience has shown that in order to comprehensively address violence against women and girls though mental health and psychosocial interventions, the response must take a multilevel approach and interventions must target both individuals and communities. This multilevel approach should consist of complementary support interventions that meet the needs of different target groups. These interventions should ideally be implemented in a concurrent manner (IASC, 2007). Source: WHO. 2012. 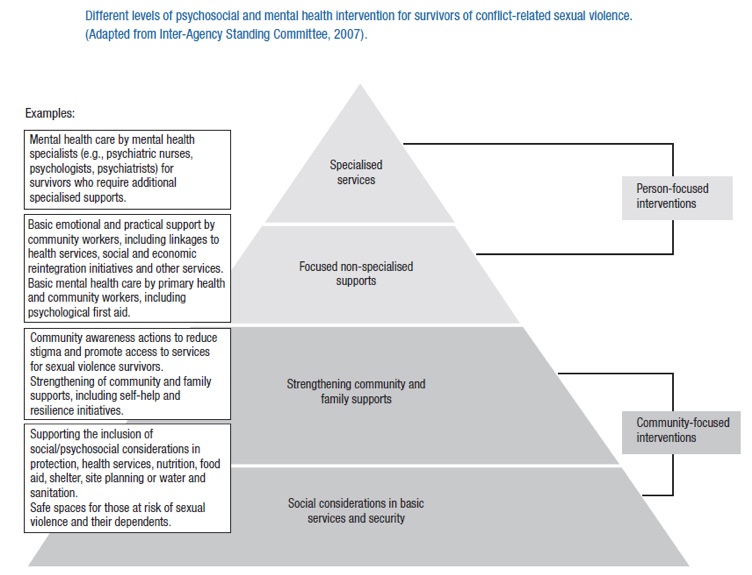 “Mental Health and Psychosocial Support for Conflict-Related Sexual Violence: Principles and Interventions,” pg. 4.